City Gateway Media kindly sent us this picture of the current Toyota campaign running on a lot of the digital screens in the UK at the moment. 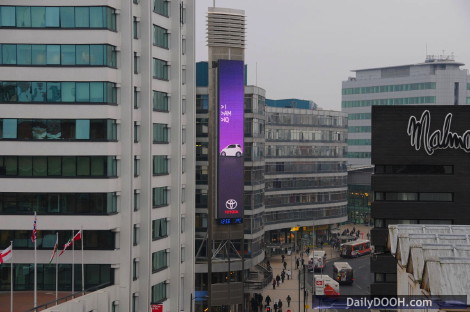 According to Posterscope, it’s a multi-format and multi-environment campaign for the launch of Toyota’s new IQ model. It’s an animated ad that allows consumers to see the car from all angles. As well as the City Gateway tower in Manchester, the campaign has been running on Westfield London LCD’s and giant LEDs (we guess CBS Outdoor and Ocean Outdoor), London Underground digital escalator panels, portrait LCD’s and cross track projections, TITAN Transvision and JCDecaux’s ‘Torch’ on the M4 motorway. This entry was posted on Wednesday, January 14th, 2009 at 12:18 @554 and is filed under Scuttlebut. You can follow any responses to this entry through the RSS 2.0 feed. You can leave a response, or trackback from your own site.